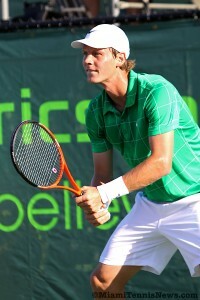 The Olympus U.S. Open series kicked off this week with the return of the ATP to Atlanta following a nine year absence. 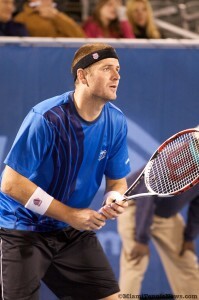 With a 4-6,6-4,7-6 victory, Mardy Fish, the sixth seed, overcame John Isner, the second seed, to carry the Atlanta Tennis Championships. Since capturing the Newport title, Fish has been on a roll and now has a ten match winning streak. Atlanta is Fish’s fifth career trophy. For Isner who played his collegiate tennis in the area, this was a homecoming. The former Georgia bulldog had plenty of supporters in the stands. With an ace, Fish sealed the first game of the match. Then, courtesy of a forehand error and a double fault, Fish had two break points on Isner’s initial service game. However, Isner held for 1 all. Serving at 2 all, Fish faced triple break point. But, by provoking a few return errors from Isner, Fish got to deuce. After erasing a fourth break point, Fish secured the game with an ace. Yet, Fish’s next time out, with a double fault and two forehand miscues, he gave Isner two more break chances. Isner converted when Fish double faulted. 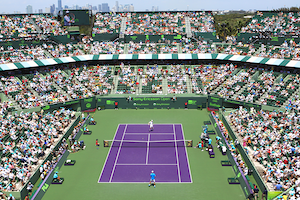 After easily consolidating, Isner jumped to a 5-3 advantage and eventually captured the set with an ace. In the second set, Fish placed more pressure on Isner’s serve. 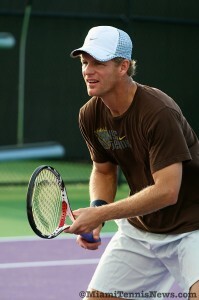 Therefore, Fish was rewarded with a break point when Isner netted a backhand crosscourt in the eighth game. Still, Isner pulled out the game for 4 all. But, subsequent to a love game by Fish, Isner committed three consecutive mistakes including a double fault to give his rival triple break point. When Isner’s forehand volley sailed wide, Fish took the second set.